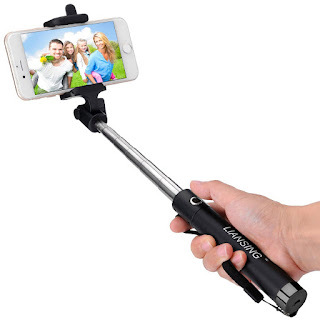 I have tried out a few selfie sticks including this LIANSING Unviersal built-in Bluetooth Selfie Stick, and was pleased with how compact this was at 7.5 inches when folded down, and just over 32 inches when fully extended. It was easy to pair with my devices, and the rubberized grips held each phone securely in place without scratching. The stick is sturdy, so I feel confident holding my phones at such a distance, without fear of dropping them. It was easy to charge, and held the charge nicely. It comes with a water resistant bag for easy portability, and is small enough to carry in your pocket or purse. I enjoyed using this selfie stick to take some group pictures so that all could be included in the shot.